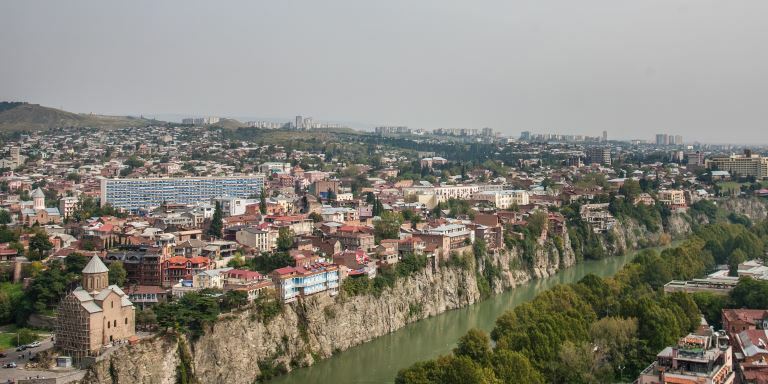 Tbilisi, the capital of Georgia. The country’s vision is to leverage its strategic location and develop its capital city Tbilisi as a transport and logistics hub. Photo credit: Daro Sulakauri/ADB. Georgia, located in the Southern Caucasus at the crossroads of Europe and Asia is an important transit corridor for Central and West Asia and a vital point for regional trade. This summary of an ADB publication looks at how meeting urban development challenges can help support the country's national plan for inclusive growth, allowing it to fully benefit from its strategic geographic location. In 2014, the Government of Georgia approved the Socio Economic Development Strategy of Georgia, (Georgia 2020), which sets out its plans for achieving inclusive and sustainable national economic growth through to 2020. To support the Government in achieving its objectives, ADB organized an urban visioning and stakeholder consultation workshop in December 2014, at ADB's Georgia Resident Mission. This was actively attended by government officials, development partner representatives, civil society representatives, academia and urban experts, with the goal of assessing Georgia's national urban needs. This summary is based on Realizing the Urban Potential in Georgia: National Urban Assessment published by the Asian Development Bank. supports the provision of efficient and affordable urban services. Asian Development Bank. 2016. Realizing the Urban Potential in Georgia: National Urban Assessment. Country Sector and Thematic Assessments. Manila. ADB. 2018. Asian Development Bank and Georgia: Fact Sheet. Manila.